Update . . . I am so sad. No one commented about the giveway. I'll repost later and add some more interesting items. My Friday Show and Tell is below this post. . . please check it out too. Is the give a way. 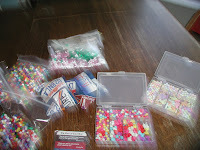 There are a lot of craft beads for bracelets or whatever you want. There are some stickers that I didn't photo. On another post I'll post exactly what is already set aside. I'll shove all this in a priority mail box and send it off to the lucky winner. Here are the rules. Read them really close because this important. If you are a homeschooler please come over and leave me a comment about homeschooling. Why you homeschool or what it means to you to be able to homeschool. 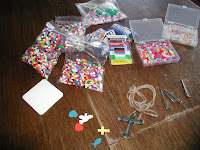 If you are not a homeschooler and you would like to homeschool leave a comment too. I'll be writing another day about my thoughts so you won't be alone in commenting if you are not actually homeschooling. Maybe your a grandparent and your grandchildren are homeschooled. Leave me a comment. Have fun and pass on to your friends. p.s. I don't know how to make this a sticky post but I'll mention everyday so pass it on. Without further ado . 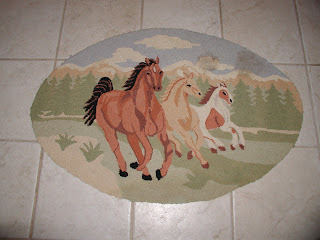 . . My Show and Tell today is my Gameroom bathroom first is the rug. I love this little rug. I ordered it off Ebay when I decorated this bathroom in the last house for our daughter. She was away at college and I wanted her bathroom at home to reflect her favorite things. Not elephants this time. Here most favorite things. Horses. Next is one of the walls. The plate hanging on the wall I also got on ebay. The light switch is one of those metal ones. 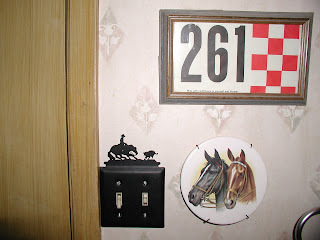 And the rodeo number framed ever so special is my number. 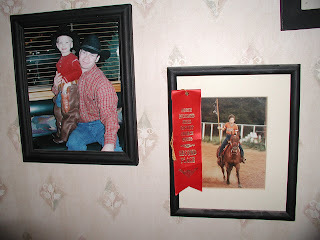 I think it was from one of the only Horse Shows (not rodeo) that I ever participated in. I had this awesome mare. And I think this is from a Halter class probably. I never showed much because I was always the wrangler/groom for the kids. So this number is special. Next are photo's of my son. When we moved into the current house the things got moved into the game room bath and so I added a few things and changed it up. (I wish I had taken photo's of the first bathroom there was this cute little shelf and we had boots on it and some other things) Anyway here's the next photo. On the right the one with the red ribbon is our son at maybe 10. This was taken at a Rodeo. Way back then the church that we went to had this awesome rodeo every year. It was really neat for everyone because it gave city folks a chance to live like we all think Texas is. As it was. (As it should be if you ask me.) On the left is my son much older with my gandson. My grandson calls me Texas Grandma. Last I couldn't show all these photo's without showing this one. I had to take it off the wall and scan it because the bathroom is tiny and I couldn't get a good photo. Here's the neatest one I think. This is our son and his reining horse futurity colt. This colt he raised. 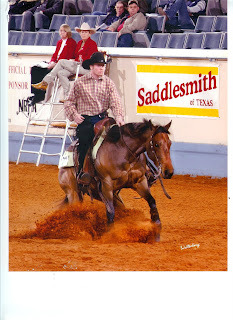 This photo is taken in Okla. City at the NRHA reining futurity. He drove from Missouri and we were back in Texas by then so we drove there to see him. Although he didn't place this was an amazing opportunity and I was a really proud mama. Isn't he handsome! I'll write more about him and Speck in a Saturday post. I hope you've enjoy my Show and Tell. Go over and visit Kelli. And don't forget to come back tomorrow and see Daisy's story and I am having a give away. So come tomorrow and check it out. Happy Show and Tell Friday. 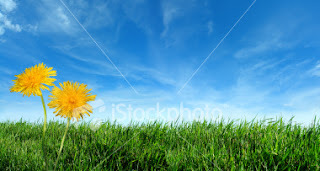 I am thankful for the beautiful sunshine today. Every morning when I wake up and the sun is shinning I am so happy. I love to look at all the photo's of snow but I love my mostly warm Texas weather. I lived briefly in Boulder,Colo. now I could have stayed there but the Lord took us to Missouri. And thinking about living there reminds me of something that I am very thankful for. When I started writing this post I really didn't intend to write about this although I have been thinking about it for awhile. And, I would love to show you some pictures. So I am going to cut this short. And go find some photo's to scan. So hang on and I'll write more a little later about our whole experience. And maybe open a discusion with some of you on Home Schooling and being a Stay at Home Mom. (notice I don't shorten that) If you are a Stay at Home Mom be proud. You are Blessed. You have lots and lots to be Thankful for on this Thankful Thursday. And most of all don't let anyone challange you or ? you or your sanity or degrade you for your decision to Stay at Home. If that is the case for you or you struggle remember this . . . The Lord is my strength and my shield; my heart trusts him, and I am helped. I recently joined a new church actually it will be two years in April. But it still seems new. I don't know why. We are connected with our Sunday School class. And they are awesome I wrote a post a few days ago about them. We haven't really got involved in any other way because of the ministry. I don't know if that is why it seems like it is still new or because it is just a short time compared to the lengths of times we have been in other churches. I don't know. Anyway. They have this amazing class on memorizing scripture. I have always wanted to go but the timing isn't right. They not only memorize verses but they memorize chapters. There is this awesome young lady in our church and she quotes entire chapters. Her speech is just darn pretty. The scripture just flows from her. She is young and cute and pretty and it is just a beautiful package. She is almost angelic when she is reciting. 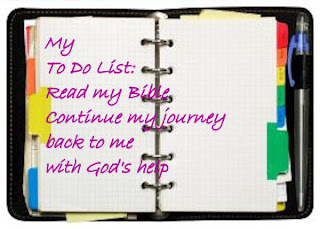 One of the things that I put on my list of things to do in '08 is to memorize scripture. So I have been working on it. I realized last week that taking a verse a week is a good way for me. Hopefully in a few months I'll be able to add more. Maybe a weekly verse and a weekend verse. But for now one a week works. And they are one verse maybe two at a time. Not a chapter. I am not there yet. And when I say the verses it doesn't sound pretty. But they are in my heart and I remember them so that is what counts. I chose this verse because God has really been talking to me about Joy. And so I made the pretty little photo in Coral. I am sure it looks pretty elementary but to me it is amazing. (see my label at the bottom!) Here's my verse of the week. The Lord is my strength and my shield; my heart trusts him and I am helped. Dear Lord. I am working on having joy. I know we talked about it yesterday and this morning. Thank you for giving me many things praise you for. Our hope. Our reason for joy. Thank you Lord Jesus for being my redeemer. My source of strength. Help me to always remember I have reason for joy. There are times when all we can do is trust in the Lord and know that all things work out for his good. Many times I have to do that. And I pray everyday that the decisions and choices that I make are pleasing to him. There are so many verses that speak about this truth. I thought about this verse all week. Then today I read part of Psalms 28 and read this. Sometimes it is really difficult for me to be joyful. I know that I should let fears or circumstances rob my of my joy. But they do. I am not necessarily sad or depressed. But I worry and I fret. And so all these things take away the joy that I should have just resting in the knowledge that I am redeemed. 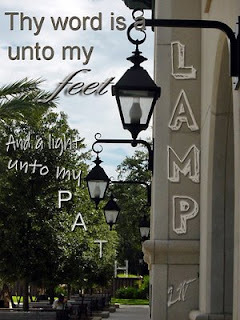 Tonight I think that I will rest in my fathers arms and ask him to show me which verse that I should learn this week. Tomorrow I will post the verse of the week. Amazing is all I can say about my day. I spent the entire morning and afternoon with who know how many screaming teenage girls. 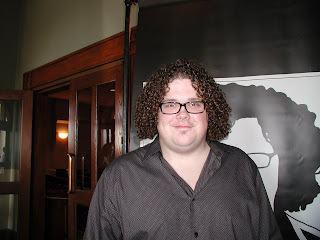 If you read my post Thursday you probably know I had no idea who this was. Do you? I am sure that all of America knows. But I have to admit I didn't. He was gracious enough to let me take his photo even though I yelled across the lobby and called him by name and then when he didn't immediately stop yelled another name (I really wasn't sure what his name was). He then waved. Later I apologized and he did let me photograph him for one of the girls. I have to thank White's Chapel United Methodist Church for giving us the tickets. It was an awesome treat for my girls! 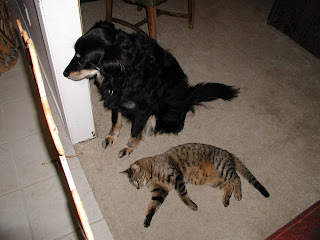 I know I promised Dog and Cat stories on Sat. so I have to give you guys the next installment. I know some of you want to hear Daisy's story but I have to lead up to why her story is so important. So today I will tell you about Bear. I cannot tell you how amazing this dog was. He was a registered Lab and had been through obediance and retriever training. When we first got him (he was 2 1/2 past the chewing on things stage!) he was so well trained that he wouldn't get within arms reach of any piece of furniture. He quickly learned that in our house a dog is part of the family. And the couch was just as much his as ours! 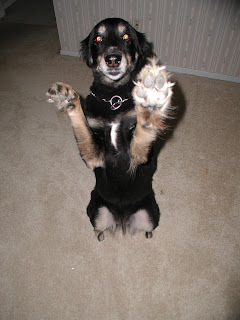 He was the best dog for the kids. He would come outside when I came home from getting groceries and he would help take the groceries in. He carried the toilet paper and paper towels and anything in a box. Stuff like mac and cheese,minute rice etc. He would actually get mad if I didn't let him help. He also learned to "fetch" individual Blue Bell ice cream cups out of the freezer (we opened the door)and he would take it to whoever was waiting in the den. Then when he was done eating he would take the empty container back to the kitchen and drop it in the trash compactor. He loved it when I took a bubble bath. He always tried to get in the tub and when I wouldn't let him he would sit beside the tub and try to drink the water. 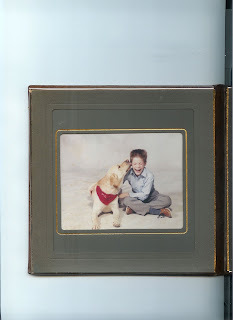 (yuck) We loved that dog. He would sleep between me and my husband. Not the entire night usually but at least part of the night. We never let the kids sleep in our bed. (some would think that horrible but)and some would think us horrible for laughingly saying that if we ever got divorced we would have a custody battle over the dog! LOL really. Bear was so amazing he even accepted a puppy into our lives. We got Noel for Christmas when our daughter was in 2nd grade. Bear fetched balls like crazy. And even played soccer with the kids. He tolerated Noel. When we would throw a ball he run to get it and Noel would grab his bandanna and hang on for a ride. Or bite his ear. He always let her! Noel never learned to fetch. (I just think some dogs just don't know how. I think it is the breeding.) We had Bear well beyond most Labs live. He was almost 13 when w finally put him down. Noel was raised with Bear and we all worried that it would be hard for her when we put him down. She wasn't a puppy anymore either. Our son was married then but our daughter was back home from college. Bear was awesome. Bear was amazing. We didn't think that another dog could ever replace Bear. Bear and Noel both have unique individual stories that I'll share soon. And, I'll share more photo's too next weekend. Thanks for spending part of your day with me. And thanks for patiently waiting to hear about Daisy. Her stories coming next! 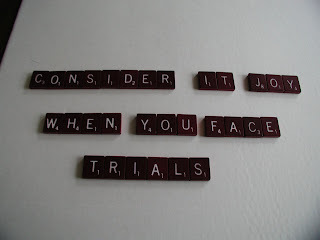 Consider it pure joy my brothers when you face trials of many kinds. You'll have to wait a few hours to read todays story. 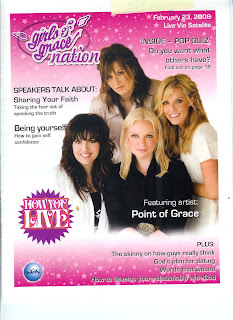 Because I am about to go the Girls of Grace Conference. I'll be gone all day. I am priviledge to be able to take 10 of the girls that we work with from the halfway house. I had a hard time sleeping last night. I kept waking up and thinking about them. I prayed that they would make it safely to the church. I prayed that God would prepare each of the hearts last night while they slept to be open to him. I prayed that the concert although I know it will be awesome Praise music that it would also be envanglistic. I prayed that God would reveal himself to them individually. I prayed that someone would receive Christ as their personal savior. Please pray with me today for all that will attend the concert. I'll be back later and post my story. Consider it pure joy you face trials of many kinds. Because the testing of your faith develops perseverance. I was prompted to show this collection by a comment from my last weeks S/T. Last week I showed my cookbooks and bookcase reading area I recently put in my kitchen. 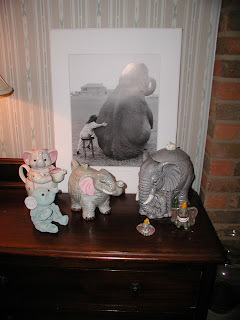 (check it out) On one of the shelves is an Elephant creamer or small pitcher. That particular item is part of a collection that I will share today. But before I share the collection let me show you how it started. This my daughter holding an elephant that my sister gave her for her birthday. So began the saga of the elephant. At one count there were over 200 in the collection. Don't worry I haven't posted them all only a few. The little blue wrinkly guy and the Dumbo's are just part of the collection and I don't really remember anything special about them. I am sure that my daughter can. I'll see her today and she will see these items in the living room. That was my hint from yesterday. The are sitting on the dresser on the far side of the fireplace for now. This last photo I saved because it is really my favorite of the entire group. I did not buy it for my daughter. I bought it for myself. It sits in her room on the dresser. (I don't always hang pictures. You'll see when I show you my den). I don't know if you can tell why I like it so much. To me this looks like my daughter and one of her big friends! She was in college when I found this and just had to have it. It brought back many memories. I hope you have enjoyed my show and tell. Don't forget to come by tomorrow and read the dog story. I promise soon I'll post Daisy's story. We've been playing Scrabble and having loads of fun. At least my husband has been having fun! The man can play Scrabble. And if you believe in luck he has it. Or he knows how to cheat well. Since he has been recovering from knee surgery I have been trying to keep him from getting too bored and Scrabble has been a fun a way to entertain him when he is totally bored with t.v. For the first time we have been watching American Idol. He has been watching Rachael Ray in the morning and then again in the afternoon. And, we have been watching Decorating Sense which is one of my favorites I love trash to treasure. 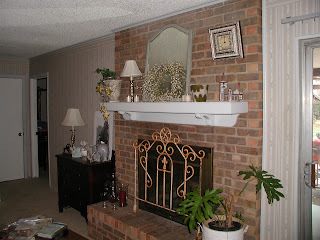 Speaking trash and treasures here is a photo of my fireplace. I love it. The mirror is old I managed to talk my mother in law out of it. She used to buy and sell antiques and ended up with it but couldn't sell it. I am sure it is not all that old but I like it. The metal screen in front of the fireplace I bought at my favorite little antique store. I don't know what it was originally used for but I just think it is pretty. Sometimes I put it in front of the doorway to keep Daisy contained. 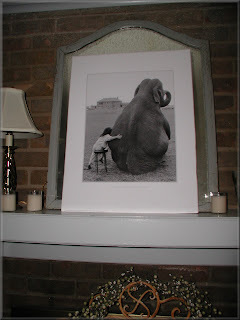 And somewhere in the fireplace photo is what I will be posting about tomorrow at Kelli's Show and Tell Friday. But I am not letting the cat out of the bag. (that isn't a hint). 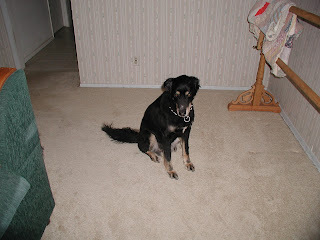 I will be writing the next installment on Saturday leading up to Daisy's story. I think I have decided that Saturday will be my day to write about the animals. They are all a Joy to me and I am thankful for them. I hope you all enjoy thier stories. Because the testing of your faith develops persverance. Perseverance must finish it's work so that you may be mature and complete. Perseverance must finish its work so that you may be mature and complete not lacking anything. Sometimes do you wish that God would finish working on you? You know when things just seem to go from bad to worse. You think you are in his will. You really feel like you are but then you begin to have doubt? I guess that is when you can turn to a verse like this and realize that God is working even when we don't see any evidence. 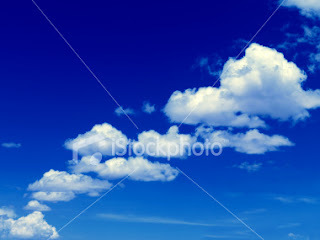 He gives us many things to be grateful for like a blue sky. It was so beautiful yesterday. I was working outside in a t-shirt. Yea. But with all that beautiful weather I face another trial. It is trivial in comparison to some of the other things. I face this. Which perseveers and produces this. It makes me realize that as much as I try to rid the yard of this pesky little weeds that it must be what God is trying to do with me. He is trying to rid me of my pesky little issues and problems. And those mistakes I make that sometimes I don't even realize. This is what I read this morning . .
Do not let me do wrong on purpose, Lord, or let sin have control over my life. Then I will be innocent and not guilty of some terrible fault. Let me words and my thoughts (and my actions) be pleasing to you, Lord, because you are my mighty rock and my protector. This is my prayer today that as I perseveer through many trials that my words, my thoughts and my actions are pleasing to you Lord and that you will teach me what I need to learn. p.s. I almost forgot. 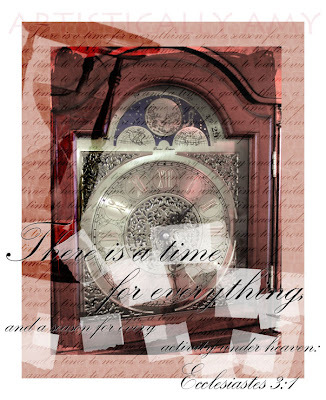 Over on the sidebar is Amy's awesome Wordfill Wednesday. This is what I worked on this weekend. Hopefully by the end of the month it will be a little larger than twin size. My daughters birthday is March 31 so I have a little over a month. Right now it will cover the top of a twin bed so I don't have a lot to go. This is the cathedral window pattern. It is completely done by hand! Wow that is a lot of stitches! I have been working on it longer than I care to admit. I have got to get it done for this birthday! 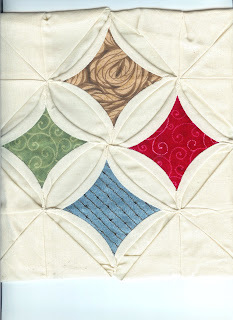 My daughter has been complaining since before she got married that I have not made her a quilt. I made my "Son in Love" a quilt for his birthday the year they got married as a special welcome to the family. My goal for finishing it; is her birthday because they are expecting in May. I want to make one similar for my new grandbaby. (except I'll do the main part on the machine. I found an ok machine stitched pattern) We are going to look this week for horsey theme fabric for the baby. The babys quilt I'll only make to just cover the top of the crib to go with the bedding which we haven't started yet! I don't know if I learned, realized or remembered this weekend while I was working on this quilt that I work best or function best when I organize myself. I am not really a list writer. Understanding that about myself this weekend was a part of my journey. If I don't discipline myself I end up getting a mess of projects going and not finishing any of them. And my goal of the month is to get back to the memorizing the verse of the week. I got off to a really bad start last week. May I use Valentines Day as my excuse? Consider it pure joy, my brother whenever you face trials of many kinds, because you know that the testing of your faith develops perserverance. Perserverence must finish its work so, that you may be mature and complete, not lacking anything. As I face trials Lord help me to remember that you are there holding me up and seeing me through. One step at a time. Today I am doing this . . .
Actually these aren't my boots but aren't they totally cute. 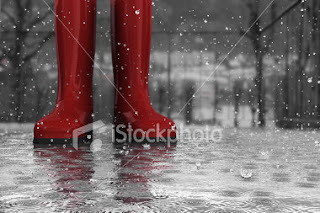 I wish I had a pair of red rain boots! But I am tromping through the rain to take care of the animals outside and when I come in this is what my boots and floor look like. Actually no these aren't my boots either nor is this my floor. My floor is actually dirty but we can pretend right? And this is not a photo of my cat but isn't it interesting? I was looking for a photo of a rainbow and I saw this one and thought it was neat and well it does actually look like my cat. And I thought it would work for the story I want to tell you about our cats. I know I promised to tell you Daisy's story but I realized that before I could tell that one I needed to set it all up with the cat's story. Our house was a two story. My husband traveled and so we got a burglar alarm with motion dectors. We started having problems with the alarm going off when we weren't home or in the middle of the night. We found out it was because the cats would go up and down the stairs and set the motion dectors off. So we started locking the cats in the utlity room at night and while we were gone so they wouldn't roam the house. My husband is not a cat lover. (so he says)I don't think I mentioned that the kids and I had to beg for the kittens. He is a dog person and just basically tolerated the kittens (he hates a litter box) but he is a good father and of course all kids need animals. My husband had a habit(still does actually) of staying up late and watching t.v. The kids and I had gone to bed one evening. I went down a little later and found my husband asleep on the couch with our sons kitten Stripes. He had gone into the kitchen for a snack and the kitten was sticking his little paw out from under the door. So my husband took him out. This became his almost nightly ritual he would let the cats out for a while before he went to bed. As I type this my husband is laying on the couch with the current cat asleep on his stomach. My husband doesn't like cats. Does yours? Verse of the week . . .
For my show and tell this morning I am showing my two Valentines. 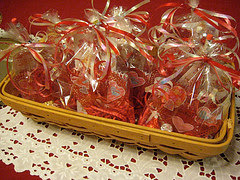 I hope you enjoyed the Valentines Day Party here at the blog and maybe met some new people. 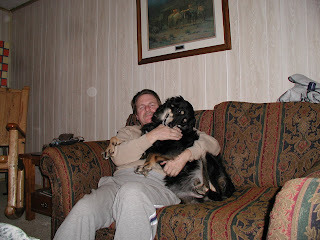 Today meet my Valentines my husband (he's the one in tan) and my dog Daisy; (she's is the one say "grr") They are playing here. This is one of the most recent after Daisy got a haircut. We took her this place where you can bath and cut your dog yourself. It wasn't a great haircut but cheap and boy has it cut down on the dog hair on the carpet. She had a really long pretty coat but everyone likes her better now with her short hair cut! Notice the off whiteish/tan carpet. Well I used to vacuum everyday because it had black dog hair all over it. Now I only have to vacuum every other day. We also have a black cat. What was I thinking? This last photo is Daisy sitting "up". (sorry I am editing and noticed it isn't turned right. I'll fix it later but I have to take care of the horses first) My husband kept telling me I couldn't teach an old dog a trick. (she is 4) She sits "up" like a little dog. And has learned when company comes to sit in the living room politely till they come in and then she sits "up" and then she shakes your hand. I will be adding more photo's of hubby and Daisy soon so please check back and see some of them and also the story of how we got Daisy. I'll tease you with a verse that paraphrases says something close to "God hates divorce". I hope you enjoy my show and tell today and come back over the weekend and read about Daisy's story. Oh and don't forget to go over at visit Kelli's show and tell. Her button is in the side bar. The Greatest Gift . . . Who's your Valentine? A few days ago when I started this little Valentines Day Party I asked the question who's your Valentine. Most everyone that responded said their husband but one sweet lady said Jesus Christ. I was saving this till tomorrow but the Lord prompted me to share it today. I was working on Valentines Day boxes for the teenage girls that I mentor and disciple and I am including this for each of them. Most of them have not accepted Christ as their savior. They still have many questions concerning his love and God's love. I hope everyone enjoys this and maybe if you haven't seen it before then you will be able to use it for your Valentines Day activities. 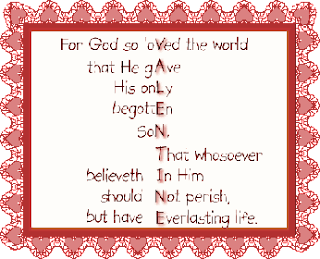 If you don't have a Valentine don't forget that God loved you so much that he sent his son for you and that is the greatest love of all. He is your Valentine. p.s. there is another post for today please read it. It will bless you. The other day when I read this post I was overwhelmed with the sweet spirit this lady has. 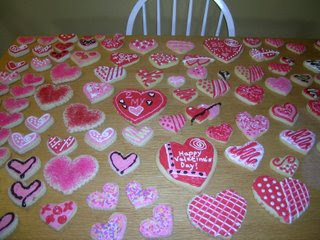 These sweet cookies she baked the other day and then invited a few friends over for a decorating party. What a neat idea. I know they had tons of fun. You can see by the photo's on her post. But the thing the overwhelmed me was her plan for the cookies. Tomorrow she is going to deliver them to her neighbors. What a sweet idea. Do you notice I keep using the word overwhelmed? Well that is becuase it is at htttp:www//overwhelmedwithjoy.blogspot.com that you can see the post she did an amazing job and I think she should get the award for sharing. Is there one? Well there should be. I know that God is Blessing her for her sweet spirit and her enthusiasm to share his love in this sweet way. Please come back tomorrow for a very special post. Be Mine . . . Party con't. 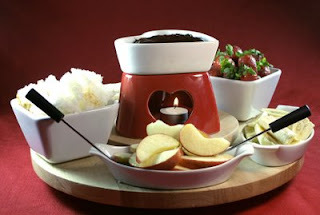 This just look so yummy and sweet. 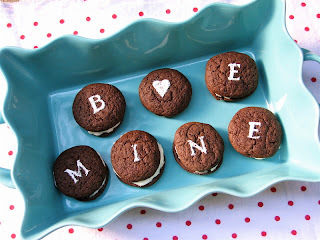 Hurry on over to morganmoore.typepad.com and see the rest of this post she includes the recipe and more photo's of these sweet cookies. 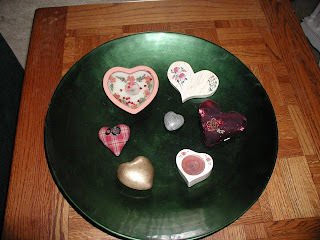 She also has some earlier posts with other Valentines Day ideas. This is going to be a short post because I have a million things to do but I did not want to you guys to miss the party. On my Sunday post I mentioned memorizing scripture and I'll try to write more about that later and what is going on with me. Thinks are brighter today. I mention Sundays post because this is the scripture or at least part of it that comes to mind today. I don't remember the reference this is all that popped into my mind. I hope you all have a Blessed Day. As always Kelli at Theresnoplacelikehome.blogspot.com has some amazing ideas. Kelli we never tire of your wonderful projects and photo's. (she though we might be bored with all the Valentines Day hoopla) Not here we are always in the party spirit at least we try to be. More on that later though. Kelli had a wonderful birthday party for her daughter last week and these were the party bags she made for each of the girls. They are quite cute. 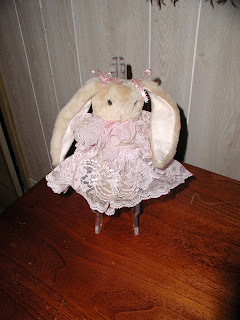 Please go over and read Kelli's blog she always has wonderful ideas.
. . . on another note if your reading me. ( I know there are some lurkers out there) I really need your prayer this week. Today actually. We are in an extremely desperate situation with our ministry right now. God has always been faithful. For the last four years we have been in full time ministry and God has supplied all our needs. Many times it was at the 11th hour. Today we have some personal bills to pay and right now this minute there isn't enough money to pay them. Some of our support checks are late. I am praying that I will find them in the mail when the mail man arrives. I know that God is in control. I mentioned a couple of weeks ago that my husband had knee replacement surgery. His recovery is very slow. He is not sleeping at night and living on pain killers. So I have taking care of him and the farm and all the animals plus the ministry to manage. And to top all that off my Bernina sewing machine died yesterday. It was my source of extra income. I was in the middle of making aprons to sell and bam it just decided to quite. I am not whinning. I have learned a lot in the last four years. I have learned not to be angry at my husband (which I was for awhile; I mean isn't he supposed to be taking care of me? that's another post) I have learned to trust and depend on God. Today I have to trust that he has the answers because I don't. I am sorry right now my mind isn't functioning well enough to put up the verse. I'll add it later. I have to get back to taking care of this business. Please if your lurking out there and you have been Blessed by my writing. Or, if you have joined me on the Valentines Day Party please pray for me. Please pray for my husband. And please pray for the ministry. Please pray that God will supply all our needs. Thy word is . . . 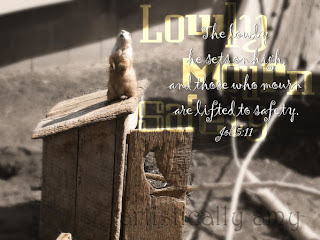 I found this photo over at Laurel Wreaths and it along with reading on someone else blog about scripture memory got me to thinking. The last couple of weeks I have been posting a new scripture each day with my post. I realized a couple of times that while I was typing and then editing my typo's that I began to memorize some of the verses I used that I did not already know. All this got me to thinking and then today in Sunday School a couple of verses were mentioned and some of us were trying to remember the reference. Do you ever have that problem where your thinking of a verse but don't know where it is. Or you read a passage and run across a verse and something in the back of your mind reminds you that you memeorized that verse a long time ago but haven't used it lately so it is somewhere just sitting around almost collecting dust waiting to be retrieved and used. One of the goals that I meant to put on my 8 in '08 was to memorize more scripture and so to that end I have decided to try doing a verse a week. Each day for the next week at the end of my post I'll have the verse of the week. I figure that with all the typo's that I usually make that I'll write each verse at least 14 times. Is that right? Once a day for 7 days and then again for typo's yes if my math is right that is at least 14 times. So just maybe I'll have a good start on memorizing some verses. I would love to have you guys join me. This really isn't anything fancy (mainly because I don't know how to put up a fancy button or do that Mr. Linky thingy...this post will be under my dummies at blogging category) just leave me a comment and then type the verse in your blog at the end of your posts. I hope everyone had a Blessed weekend and I hope you are looking forward to an awesome week. Here's our verse. Today I am taking a break from the Valentines Day Party to do show and tell. Kelli over at There's no place like home is hosting this Show and Tell that I have been trying to do for awhile but I have had issues with the computer and the camera. But thankfully I can finally I kind of my issues resolved and can post photo's. So here is my first show and tell. Here's hoping I can post all these photo's. 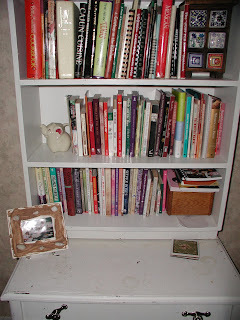 This is the before photo of my bookcase that holds part of my Cookbook Collection and my books. (excluding my novels) The top is a bookcase that my parents had while I was growing up. It was stained a honey color. I got it about the time my daughter was in jr. high. We tried doing a crackle technique that didn't turn out too well. It was first painted red then black. We wanted the red to show through. When she went to college I got it back and painted it white. 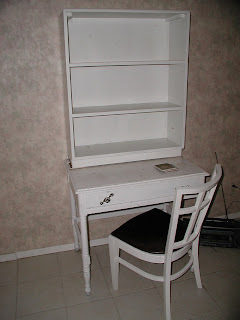 The desk came from my in laws and was also painted black/red. My daughter didn't use them this way with the bookcase on top. I like the look of the bookcase on top. This last photo is of a cute little antique (I think) shelf filled with some of my favorites. I think you can see them better in this photo. 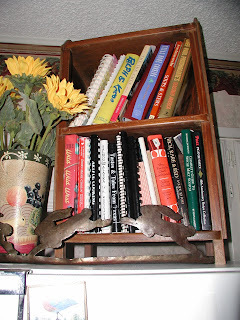 Also photo'd is my flower tin with painted folk art rabitts. It is about 15 years or so old. It complimented a wall paper line that had a border with the rabbits on. In front is a tin cut out of rabbits. I don't know where I got. I love rabbits as you are probably figuring out. Maybe next week I should show them. hmmm. ok actually it didn't turn out exactly as I wanted but I am going to leave well enough alone. I have more photo's of my cookbook collection that I will add. But, I am satisfied with the fact that I got these up. I meant for the empty bookcase to be first but it didn't work out that way. I quess I will have to put this post under my dummies at blogging catergory. 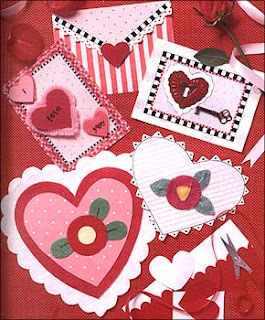 Valetines Day Decorating ideas . 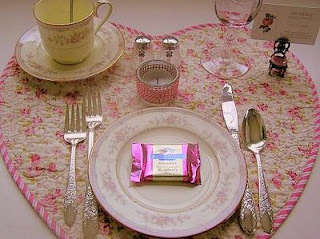 . .
Today instead of taking you on a tour of some friends places I am showing part of my Valentines Day decorating. Actually I guess it is all of it because I haven't done much decorating. I have spent too much time looking at the blogs. 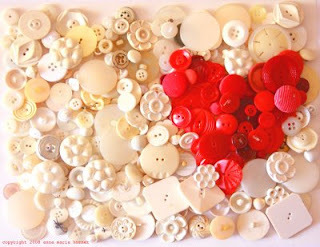 This photo is part of my collection of hearts. The gold one is lick a rock that I bought somewhere and I love it. Then there is the grey one it is a rock too. There is a candle, and the little homespun plaid one is fabric and is actually a pin. (I never wore it as a pin. . . I bought it for this collection) It actually had some greenery on it a few days ago but the cats stole it out of the dish and now the greenery is gone I guess they ate it! Is the dark maroon on in the photo? I don't remember it keeps ending up on the floor too. I think it is my favorite it does compete with the gold one though. the maroon one is velvet with beads on it. It has a hanger so it can be used as a Christmas ornament. I bought it after Christmas at Dallas Baptist University gift shop it was on sale really cheap (my daughter went to DBU) and last but not least the green bowl which I just love. I bought after Christmas at Crate and Barrel and it was cheap,cheap,cheap. Not originally though I just love that store. But anyway it was almost free because that year I got gift cards from American Express because of all our spending points. I just love that bowl. It sits on the coffee table most of the time usually empty but sometimes I put things in it to display. Well I hope you enjoyed seeing my small little collection of hearts. Tomorrow I'll be doing Friday Show and Tell. So no V.day party. But the party will be back on Saturday. Don't miss it. Is everyone getting ready for Valentines Day? I have to say I thought this would be a fun party to host but I'm am having a difficult time finding people out there actually posting. 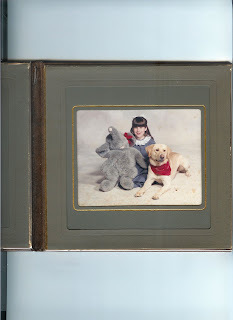 I do have some wonderful photo's waiting and some cool ideas and stories that I have found from some so don't worry we will still have a wonderful party. And I had this idea after seeing other blogs that I will take all the photo's I used and make a collage. Hopefully I can figure out how to do it. Today I have to figure out how to put on more than one photo. I found a tutorial the other day about that. I have to do it today because tomorrow I will be doing show and tell over at Kelli's. Kelli did you hear that. I have the camera issue worked out! Now I have to figure out how to post more than one phot. But I am determined. If I can't do it I'll just do more than one post! Watch for my show and tell Kelli! Love your blog! See you guys later . . . I still have to feed horses,rabbits,dogs,cats me breakfast. Valentines Day means Chocolate does it have to be Valentines Day? Hi. Thanks for coming to our party. This lovely little Valentines Day treat came compliments of Annamariehorner.blogspot.com she has a lovely little blog and makes some awesome things. Go over and visit her and pick up this photo for your blog. She is offering it free. What a gal! I have decided to add the verse of the day to the end of each post because I am not sure that I can archive them. This way they will be there in the daily archives. I hope you enjoy and are Blessed by the verse and by the party fun! 2 John 1:6 And this is love: that we walk in obedience to His commands. Did I tell you my Sunday School Class rocks? I have been playing around all day with the camera. Did I mention my camera problem? Well I broke the computer in Nov. so I was without it till after Christmas. Santa (through a really special person)brought us a new computer. Yea! But the camera and computer don't talk to each other. We tried everything free but it just won't work. Can't afford right now to buy anything. So the cheapest route is go and get a c.d. So that is what I did today. For the last hour I have been dealing with Kodak software. Grr. Gave up on it and opened up Corel Paint Shop which I downloaded a free trial last night after Randi and I have to say mentioned it in a post. Anyway. Well while I was messing with it I saw this little icon that said something about get photo's from and it had this list and on that list was Yea! Scanner! Cool beans. I have been trying to figure out how to get the computer to talk to the scanner and no luck but. Corel Paint Shop talked to it and this is the result. 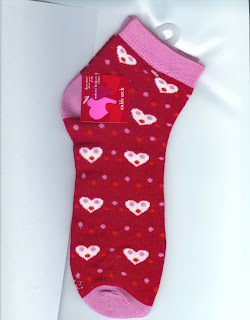 I scanned this darling pair of socks that someone in my Rockin' Sunday School class donated for the girls at the halfway house. I took a bunch of photos today and as soon as I get this thing figured out I'll post them. But for now just look at this cute pair of socks. Anyway doesn't my Sunday School class rock! p.s. check the verse of the day . . . I chose it to go with the socks! Walk in Love! Did you think I forgot? Yes I was distracted playing around with the new toy. But I did not forget. Today I want to share with you what I found over at Mary Engelbreit. Go on over to her website and look at all the fun free things she offers for the holiday. I just love her stuff! I hope you are enjoying the party. Enjoy your weekend. p.s. Who is your valentine? Wow. I think I might have figured this out! If this works what is right here is my to do list. If it didn't work. Well I go back to playing with is some more. I just downloaded a free trial of Corel Paint Shop. Found the link over at my friend Randi's at I have to say. Let's see if this works.